Panasonic teases direct LED 4K TV prototype to rival plasma | What Hi-Fi? 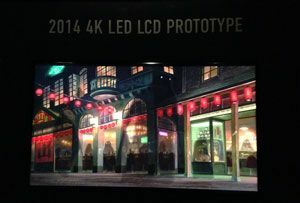 Panasonic wasn't short of sceptics when it announced at its CES 2014 press conference that it was working to offer plasma picture quality using LED technology. After seeing set after set of excellent plasmas outperform LEDs last year, it certainly seemed like a bold claim. But a trip to the Panasonic booth got us pretty excited indeed. Though the majority of the booth was dedicated to Panasonic's officially announced 4K range – the AX800 Series – in a darkened room, there was another 4K prototype to look at. Direct LED rather than edge-lit like the AX800, the prototype was – rather bravely – put up against last year's excellent top-of-the-range Viera TX-P60ZT65 plasma and also last year's 4K LED, the TX-L65WT600. The result? From our demo, the WT600 was easily outperformed by the prototype, looking washed out in comparison, no doubt thanks to the new Studio Master Colour tech in Panasonic's 2014 4K TVs. Closer in performance was the ZT65. The plasma probably still had the edge on black levels, just slightly, but the prototype LED model looked extremely promising – offering great contrast and stacks of black detail, while also offering the extra brightness LED technology affords and a noticeably cleaner image as well. This TV is still being worked on so the picture we saw was in no way the finished product, and so could well get better yet. We're expecting to hear more about this TV later in the year and will bring you the official news as soon as we have it.